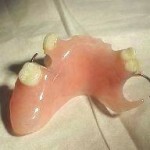 Partial dentures are indeed a cheaper option compared to bridges and implants to replace missing teeth. But, how much do you know about the procedures to construct a partial denture? First of all, during the first appointment, your dentist will examine your soft and hard tissues (etc gums, palate ,any presence of tori ) . Tori is a bony prominence which normally appears in the middle of palate or inner surface of your lower jaw. These considerations will determine whether any pre operative surgeries need to be done on you before constructing a partial denture. Other alternatives to surgeries are by relieving that region during the construction of the partial denture. Presence of any kind of soft tissue inflammations due to wearing of partial denture such as denture stomatitis need to be resolve before proceeding to other forms of treatment. If you are a previous denture wearer, your dentist will inspect any kind of denture faults and whether there is a need to redo the partial denture. He will ask you questions regarding your opinions towards your old denture and to determine whether to do a reline or rebase or reconstruct the whole partial denture is needed. If you prefer the setting of the artificial teeth to be the same like your old denture, you can inform your dentist about this and he will judge whether it is suitable to copy the same teeth setting as your old denture. An impression is made to record your denture bearing surface area which is the tissue surface where your denture will lie on . It is necessary so that your dentist will design a denture based on your missing teeth and your denture bearing area. If you have missing posterior teeth , a special tray will be constructed so that a border moulding procedure can be done to record your full sulcus depth . 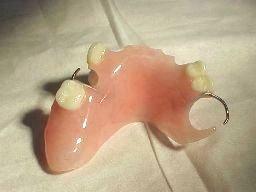 This is to allow good stability and retention of your future denture. After a good impression is taken, a wax rim will be constructed on top of your cast. (After impression is made, dental stone is poured into the impression and it will be stony hard and replicates your soft and hard tissues) The dentist will make sure that the wax rim is stable on the cast before placing it in your mouth. You are asked to swallowed and bite into occlusion (bite like how you always do). He will add wax so that teeth will come in contact with the wax rim and he will mark all the important lines as a guide to set teeth. A suitable color shade is chosen prior teeth setting on the wax rim and your opinion is important so that you will be satisfy with the final product. Then, your dentist will send the wax rim and the cast which is sealed in position to the technologist so that he can proceed to teeth setting procedure. Available materials for denture teeth are acrylic and porcelain. Acrylic is preferred as it is more compatible with the denture base we are using and porcelain tends to create one kind of sound when it comes into contact. The technologist will set the denture teeth into the best occlusion you can get before handing over to the dentist. In the next appointment, your dentist will show you how the final product will look like with denture teeth set on a wax rim. He will then place it again into your mouth and ask you to bite lightly. He will check whether all the teeth are in contact in places where it supposed to be. You will be asked whether you are satisfied with the color, size, arrangement of the denture teeth. If everything seems to be fine, your dentist will return the wax rim with denture teeth back to the technologist to flask it into acrylic material. After final trimming and polishing, your dentist will call you back for another appointment to deliver the denture. He will make sure there is no sharp edges on the denture and there is no pain when your teeth come into contact.